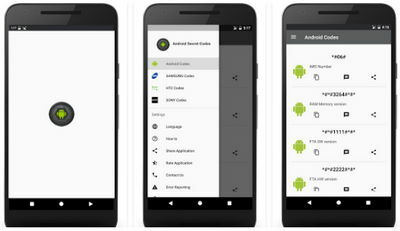 Input secret codes and unlock hidden features in your Android device thanks to the Android Secret Codes app 2018 (pro version). This tool allows you to find and exploit advanced hidden information about your device in an easy-to-use manner. Find hidden codes, confidentiality, and more on your Android OS, SAMSUNG, HTC, SONY, Motorola, LG, Lenovo, Oppo, Xiaomi, and Infinix phones (more devices will be added). These codes can be used to check used Android phones before you buy, find the device manufacturer and system version, hidden camera info, create backups of your data, plus more. Warning: Some codes shown are meant for professional use only. If you're a beginner, please do not tinker with what you don't understand. We can not be held responsible for loss of your data! This latest version 3.2.5 updated December 11, 2017 features some improvements and new easy search for codes.